Welding is one of the critical processes employed in the manufacturing sector. The growth of the latter one has a profound impact on the former one. Manufacturing is enjoying a resurgence in Europe, one of the regions with major manufacturing output. Manufacturing is the backbone of the European economy. The ongoing 4th Industrial Revolution (Industry 4.0) is impacting manufacturing at a global level, starting with developed countries, and progressively spreading to emerging countries. The ubiquitous use of sensors, along with the expansion of wireless communication and networks, and with the deployment of increasingly intelligent robots and machines, has the potential to transform the way manufacturing is done in Europe. Such a digital industrial revolution holds the promise of increased flexibility in production, mass customization, increased speed, better quality, and improved productivity. This scenario has created a need to strengthen the competitiveness of the European welding industry with an in-depth focus on technology. As per the industry sources, the market seems mature, and conventional techniques, such as arc welding and resistance welding, are the mostly employed for welding applications by a majority of the end users. Additionally, a growing demand for welding robots is also observed. With their most extensive use found in the automotive industry, welding robots can easily be reprogrammed to accommodate flexible production processes. 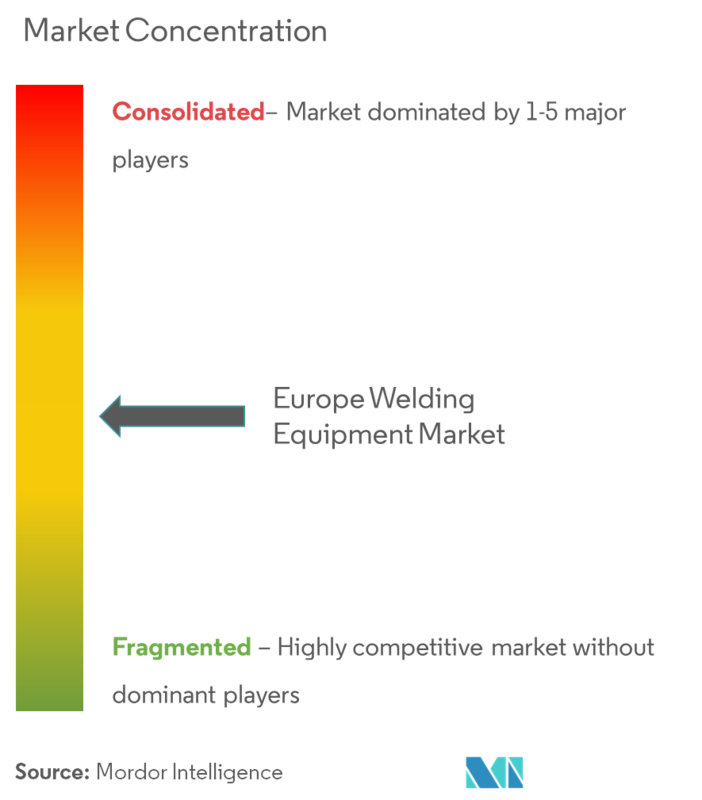 A complete background analysis of the European welding equipment market, which includes an assessment of the economy and contribution of sectors in the economy, market overview, market size estimation for key segments, and emerging trends in the market segments, market dynamics, production statistics, and geographical coverage are covered in the report. 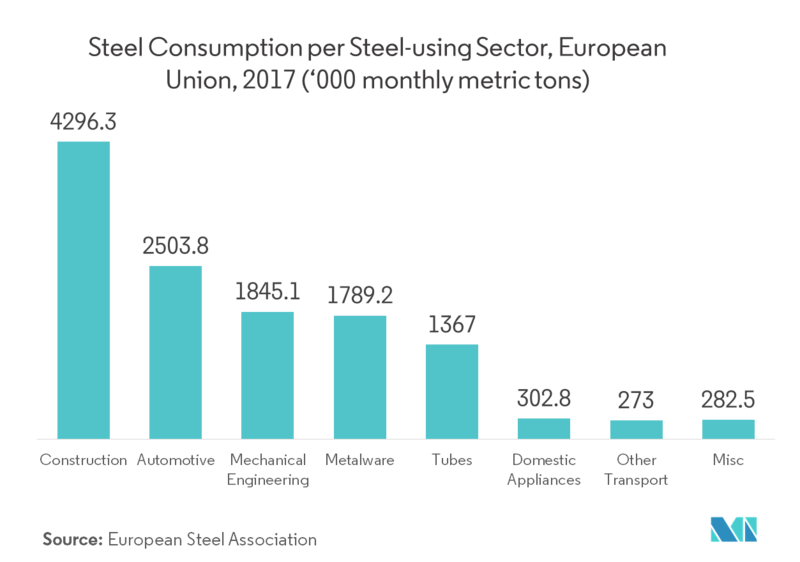 European steel industry is getting back onto a more stable footing, with employment and production levels stable or rising. Imports stalled slightly in 2017 after years of relentless growth, and the expansion of steel-using sectors continued. The overall market situation of the steel sector is relatively positive. Apparent consumption increased by 1.3% in 2017, to 159 million metric ton. Indexed steel use was up by 4.8% in construction, by 3.7% in automotive, by 6% in mechanical engineering, and by just over 7% in tubes. According to industry sources, majority of the steel consumption in Europe happens through welding process, which represents an increased trend for the welding activity in the region. Additionally, this is a good opportunity for the equipment manufacturers to tap the growing market. Furthermore, higher steel consumption is anticipated to provide more job opportunities for welders in the region. Europe is focusing heavily on implementing training modules to provide skilled workers for the welding industry. Weld 4.0 will have a profound impact on the skills and competences required of welding professionals, as well as learning methodologies, bringing them into the Digital Age. As most companies in Europe continue powering ahead to get into the Digital Age of Industry 4.0, they need to ensure that their professionals’ qualifications are updated with digital welding skills and competences to keep up with these changes. Growth in the Russian oil and gas industry has allowed the welded pipes market to expand in the country. This growth, coupled with the government’s plans to develop new plants in the future, has created a positive wave in the welding equipment market in Russia. In Russia, the oil and gas industry is the major contributor to the economy, and it accounts for 16% of GDP, 52% of government budget revenues, and 70% of total exports. The Russian oil and gas industry witnessed heavy investments from major companies, like Gazprom, Tatneft, Lukoil, and Rosneft. In the recent years, the value of RUB declined in the global market, resulting in low costs for entry and equipment. 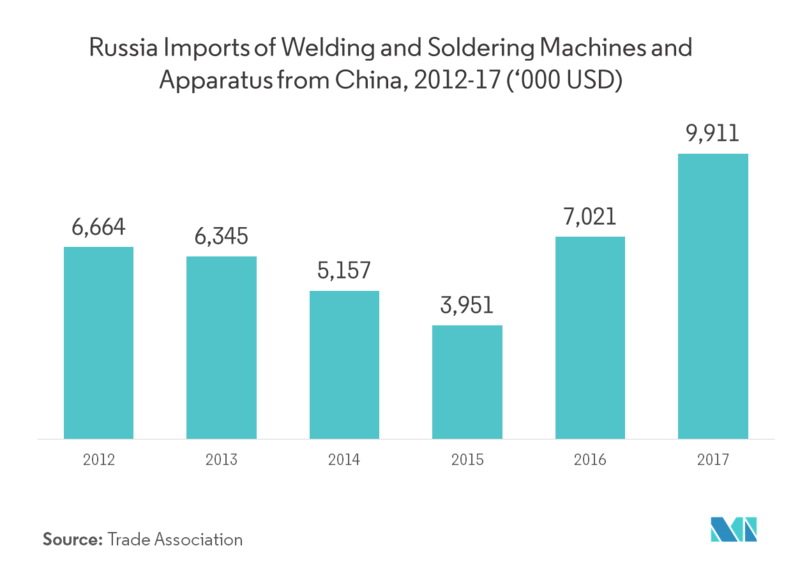 Russia imports several types of welding equipment from other European countries, China, and the United States, as its domestic production is low. In Russia, the import share of welding equipment is increasing significantly. In Russia, almost all the machinery and raw materials required for the production of welding equipment have to be imported. Thus, it is essential for companies to invest in R&D of the market studied, along with implementation of state-initiated programs for the enhancing the production capacities of welding equipment. 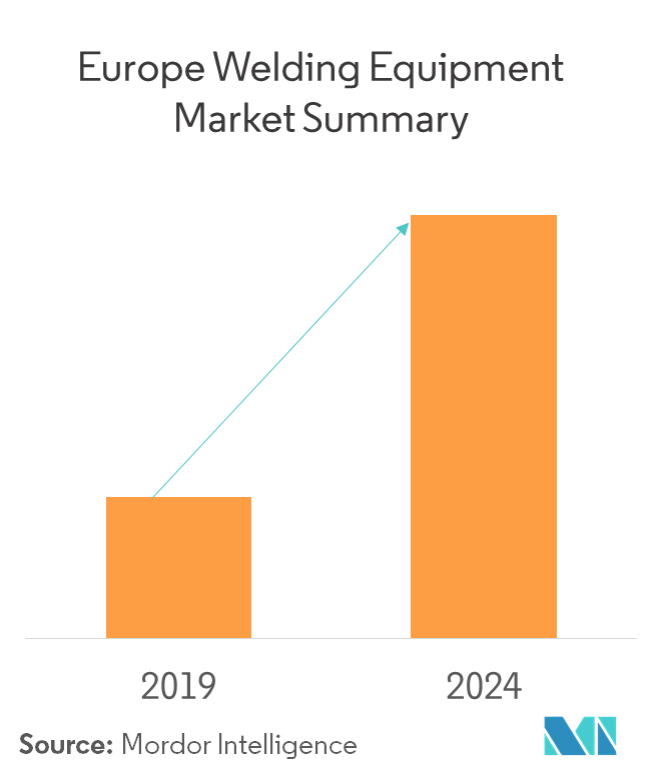 Since Europe is home to some of the top global welding equipment manufacturers like Kemppi Oyy, Elektriska Svetsnings-Aktiebolaget (ESAB), etc., the European welding equipment market seems to be partially concentrated. Additionally, some regional players are also entering into the market with prime focus on advanced technologies, which creates a healthy competition in the market.